CDU (Christian Democratic Union) is a centrist party and the largest in Germany. The CDU’s President is Angela Merkel and also the current Chancellor of Germany. The CDU opposes Turkey’s entry into the EU. Opposes the SPD and die Linke. The color orange is used in in literature and signage. Wikipedia: In practice, Christian democracy is often considered conservative on cultural, social and moral issues (social conservatism) and progressive on fiscal and economic issues. In Europe, where their opponents have traditionally been secularist socialists, Christian democratic parties are moderately conservative overall, whereas in the very different cultural and political environment of Latin America they tend to lean to the left. Die Linke (Young Left) is a socialist political party and the most left-wing party of the five in the Bundestag. DKP (German Communist Party) far-left Marxist-Leninist party; Che Guevera pictured on Web site. The MLPD has a youth organization Rebell with Rebellmagazin photos on Flickr (including Aufkleber stickers that can be ordered). NPD (National Democratic Party of Germany) is a far-right party with an ethnic nationalist position. It was founded in 1964 as a successor to the German Reich party and is often labeled as a neo-Nazi organization. Opposes Turkey’s entry into the EU. The leader Udo Voight has had meetings with U.S. white nationalist David Duke. PDS – former leftist Party of Democratic Socialism (1989-2007) merged to form die Linke in 2007. SPD – the center-left Social Democratic Party of Germany, the oldest in Germany; according to the party platform, freedom, justice, and social solidarity, form the basis of social democracy. ***All of this work only to see by chance today that der Spiegel has a quite useful summary of political parties (QUITE!, tho dated September 25, 2009). I’m not sure why the NPD wasn’t listed among the parties in their article – need to look into. Of all parties, SPD and die Linke stickers abound, and in some cases the two are joined in various stickers (need to look into that, too); to a lesser extent, I find stickers from the MLPD and a few from DKP. 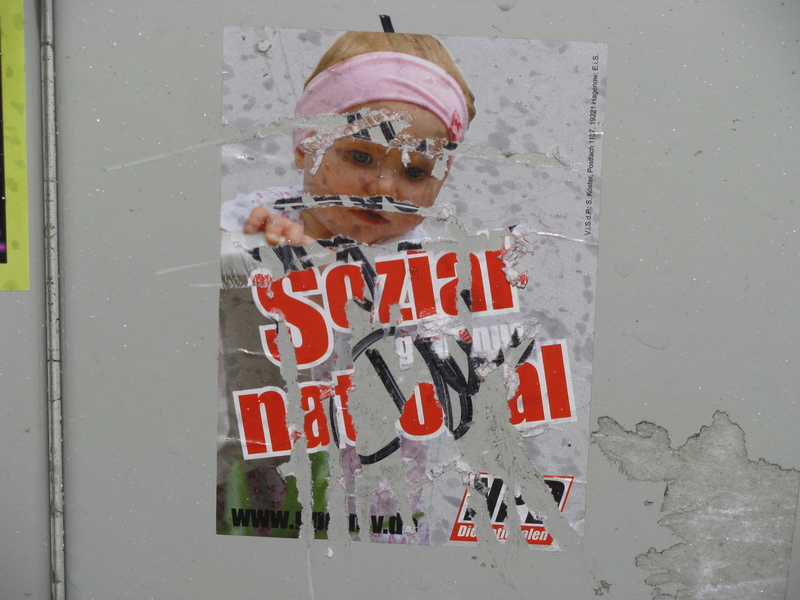 Far-right NPD stickers are quite rare on the streets of Berlin. When I do come across one, it’s usually torn or gouged like this one.